Look up the Certificate of Analysis for your Green Remedy product and see why we lead the industry in quality and satisfaction. Green Remedy wants you to make the best hemp-extract CBD decision you can make with information you can trust. We’ve created a Look Up Tool so you can find your product’s Certificate of Analysis and see the Green Remedy Difference. In today’s competitive hemp-extract CBD market, the need for Certificates of Analysis are more important for consumers than ever before. 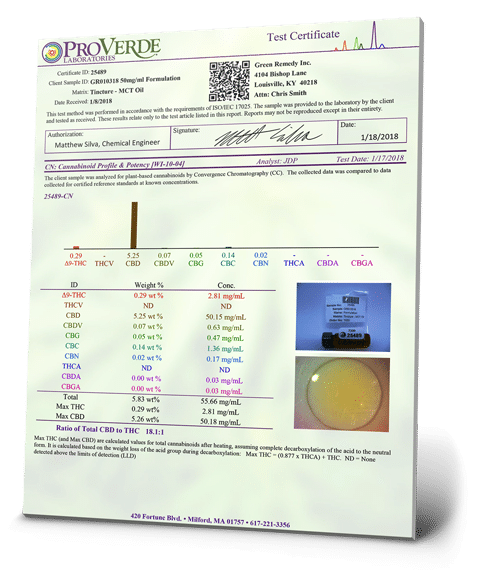 A Certificate of Analysis is a lab report that details the contents and potency of the hemp-extract CBD product and is a transparent document for consumers to use to make informed decisions as to the safety and quality of their purchase. Green Remedy makes all of our Certificates of Analysis readily available for our customers so you know you’re getting the very best quality at the very best price.